How imprisoned Native American women are treated within the criminal justice system. Luana Ross writes, "Native Americans disappear into Euro-American institutions of confinement at alarming rates. People from my reservation appeared to simply vanish and magically return. [As a child] I did not realize what a 'real' prison was and did not give it any thought. I imagined this as normal; that all families had relatives who went away and then returned." In this pathfinding study, Ross draws upon the life histories of imprisoned Native American women to demonstrate how race/ethnicity, gender, and class contribute to the criminalizing of various behaviors and subsequent incarceration rates. Drawing on the Native women's own words, she reveals the violence in their lives prior to incarceration, their respective responses to it, and how those responses affect their eventual criminalization and imprisonment. Comparisons with the experiences of white women in the same prison underline the significant role of race in determining women's experiences within the criminal justice system. Experiences of Women in Prison: "They Keep Me at a Level Where They Can Control Me"
Rehabilitation or Control: "What Are They Trying to Do? Destroy Me?" Prison Subculture: "It's All a Game and It Doesn't Make Sense to Me"
Luana Ross (Salish) has taught at the University of California at Berkeley and is currently Associate Professor of Native American studies at the University of California, Davis. And tears strong and deep will lift our voices in the public ear. I developed an interest in criminality, deviance, and imprisoned women because of my culture, race, gender, and experiences growing up on the Flathead Indian Reservation, home of the Sqélixw (Salish) and Aglsmakni*k (Kootenai). I was raised at the Old Agency across the street from the tribal jail. This jail was a tiny one-room structure that was seldom locked. Prisoners were seen walking and visiting around the Agency; no one was alarmed that they were not secured on a twenty-four-hour basis. When I was young my godfather was training to be a Jesuit priest when, due to the illness of his father, he returned to our reservation. He was a wonderfully brilliant man who had been imprisoned four times. How could this possibly happen to a well-educated, spiritual person? My godfather was not my only relative who was imprisoned; other relatives preceded and followed. It is common for Native people either to have been incarcerated or to have relatives who have been imprisoned. Because we are a colonized people, the experiences of imprisonment are, unfortunately, exceedingly familiar. Native Americans disappear into Euro-American institutions of confinement at alarming rates. People from my reservation simply appeared to vanish and magically return. I did not realize what a "real" prison was and did not give it any thought. I imagined that all families had relatives who went away and then returned. Academic issues, as well as personal, influence my interest in Native criminality/deviance. There is meager research on incarcerated Native Americans, although they are disproportionately imprisoned. Additionally, there is a dearth of empirical data on incarcerated women. Two topics that are especially ignored are personal experiences of incarceration and the special situation of imprisoned mothers, although most imprisoned women are mothers. Similarly neglected in the literature are imprisoned women of color, who represent 64 percent of the total population of women incarcerated in state prisons (Snell and Morton 1994). There is scant recognition of the special problems women of color may face while incarcerated. An underlying assumption is that all women are equally afflicted; thus, the majority of studies on imprisoned women refer to women as a homogeneous group and ignore the interaction of race/ethnicity, gender, and class. Although insufficient attention is given to imprisoned women of color, the subject of imprisoned Native American women is virtually an unexplored area. Imprisoned Native women are invisible, and, as put forth by Patricia Hill Collins (1991), invisibility allows structural arrangements of inequality to exist. I conducted the first study of imprisoned Native American women in 1990-1992. The purpose of the research was to give voice to these women by describing and defining their experiences as prisoners. I listened to the voices of the women, to their perceptions of their experiences as prisoners. While the state of Montana defines these women as "criminal" and "dangerous," I find their lives complex—bound up in race/ethnicity, gender, and class oppression. It is exhausting to recount the narratives of imprisoned women—they were troublesome to hear. It is distressing to describe and name their pain. In the words of bell hooks (1992, 2), "The more painful the issues we confront the greater our inarticulateness." 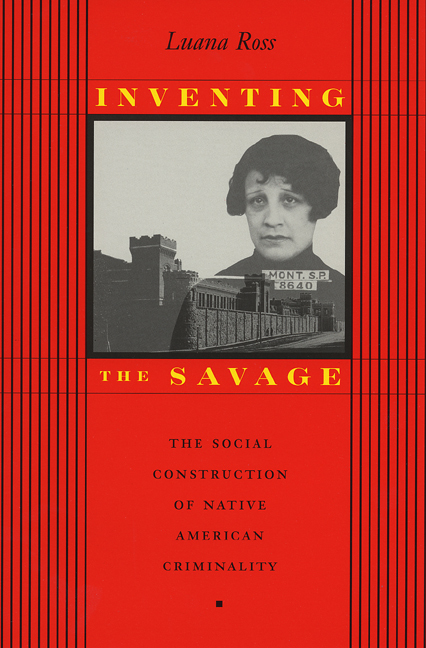 This is a book about the racialized and gendered experiences of incarceration, with a focus on Native American women and the loss of sovereignty as it is implicitly tied to Native criminality in complex, historical ways. This is also a book about the complexity of racism, as it evolved and took root in Montana, and the importance of race/ethnicity in Euro-American society. Michael Omi and Howard Winant (1994) suggest that race is a socially constructed category that changes over time. The authors separate the shifting of race and racism into three chronological stages. In the first period, during the colonization of this country, race was discussed in biological terms complete with notions of the biological inferiority of people of color. In the second period, the early part of the twentieth century, ethnicity was substituted for race as differences between groups were defined and categorized. During this time, culture was added to the understanding of racial/ethnic relations and assimilationist paradigms were developed. The third period, emerging in a time of turmoil—the late 1960s and early 1970s—witnessed radical and nationalist movements, such as the Red Power and Black Power groups. The focus was on the differences between white Euro-America and people of color. The structure of society was used as a significant explanatory factor in the obvious inequality. Accordingly, race and racism were explained in terms of class- and nation-based theories. Ruth Frankenberg (1993), using the framework of Omi and Winant, asserts that all three movements and accompanying attitudes are found in contemporary Euro-America. Agreeing with Frankenberg, I term this convoluted racism or, as it relates specifically to Native Americans, neocolonial racism. The social control of indigenous people is reflected in this complicated racism. The history of Native-white relations in Montana that I present, albeit simplistically, reveals that racialized attitudes and ideology of long ago thrive in Montana today. If we are to move toward a place of racial/ethnic understanding we must first recognize the unfortunate history of Montana's indigenous people and the dynamics of racism. Additionally, we must acknowledge the concept of Native American sovereignty. Sovereignty is a fragile concept whose meaning is shaped and reshaped by legislation and court decisions. At the same time, sovereignty is inherent; it comes from within a people and their culture. Some would argue sovereignty cannot be given to one group by another because ultimately it comes from spiritual sources. Whatever the case, sovereignty cannot be separated from a people or their culture. As expressed by Jolene Rickard (1995 51), "Sovereignty is the border that shifts indigenous experience from a victimized stance to a strategic one. The recognition of this puts brains in our heads, and muscle on our bones." The history of the colonization of America's indigenous people is a tragic one. From the time of European contact to the present day, these people have. been imprisoned in a variety of ways. They were confined in forts, boarding schools, orphanages, jails and prisons and on reservations. Historically, Native people formed free, sovereign nations with distinct cultures and social and political institutions reflecting their philosophies. Today, Native people are not free; they are a colonized people seeking to decolonize themselves. Important components of colonialism, according to Robert Blauner (1972), are the restriction of the movements of colonized people and the undermining and transforming of their culture. Blauner submits that the colonizer attempts to destroy the culture of the colonized; in this way, culture itself becomes a method of control. Accordingly, the colonized can, in turn, use culture as a powerful weapon against oppression. Colonialism as control and denial of culture is clearly evidenced by the number of incarcerated Native Americans and by their experiences in prison. The major part of this study was designed to focus on women from two different races/ethnicities—Native American and white—who were incarcerated in a small, rural, state prison: the Women's Correctional Center (WCC) in Montana. Comparing these groups allowed me to examine the specific effects of race/ethnicity. The findings were based on tape-recorded in-depth interviews with twenty-seven imprisoned women (fourteen of the seventeen Native prisoners and thirteen of the forty-eight white prisoners) and similar interviews with prison staff and a state employee. Prisoners were questioned regarding the prison's social environment, their concerns as imprisoned mothers, and the institutional support offered to them as imprisoned mothers. Interviews with prison staff and the state employee focused on programs offered to imprisoned mothers and how the mothers' relationships with their children were facilitated. The interviews were supplemented with nonparticipant observation, informal conversations with prisoners and staff, reports from the State Department of Institutions, reports and letters from the American Civil Liberties Union (ACLU), reports from the WCC, reports from the Confederated Salish and Kootenai Tribes, prisoners' legal records, prisoners' journals, and my personal correspondence with prisoners. Archival data was gathered from the Montana Historical Society, the Montana Territorial Prison Museum, Montana State University, and the D'Arcy McNickle Library at Salish Kootenai College. By comparing the experiences of Native American and white women, we gain insight into the operation of social institutions. I am interested not only in personal biographies but in how they are tied to the larger social structure. Stratification by race, gender, and class leads to different life experiences. Because I was interested in how racism and sexism functioned inside prison and affected imprisoned women, I concentrated on the women's subjective experiences of prison. Some critics of my work and of other qualitative research argue that prisoners do not tell "the truth." But I believe there are many truths; I present the truths of imprisoned women in Montana. Unlike statistical research on the prison system, my book reveals the amazing diversity of women prisoners and makes the experience of imprisonment exceedingly personal rather than reducing the women to numbers as the penal system does. In an attempt to highlight prisoners' voices, I use lengthy quotations. The identities of the women are disguised; I altered details that would threaten their anonymity. Race/ethnicity is identified but not, in the case of Natives, specific tribal affiliation. For readability, and in an effort to humanize the prisoners dehumanized by prisonization, I gave them fictitious names. Proposing that Native American criminality is tied, in a complex and historical way, to the loss of sovereignty, I begin the book with important historical information on the disruptive formal and informal federal and state policies that chipped away at the sovereign status of Native people. Through various procedures, state and federal governments defined Native Americans as "deviant" and "criminal." The historical background uncovers how the "savage" was created, invented in Montana. Native people, however, were not passive in the process of colonization but resilient and adaptive. They responded to the policies and accompanying racialized attitudes in ways ranging from warfare to cultural adaptation efforts. An overview of policy illustrates the process of colonizing and criminalizing Native Americans, as well as the evolution of colonial and neocolonial racism. As such, the historical background provides a foundation and context for the second part of the book, which focuses on imprisoned women and the criminalization process. Chapter 3 offers demographic, social, and personal information on women incarcerated in Montana from 1878 through the early 1990s. This history exposes important differences between Native women. Significantly, reservation status emerges as crucial in the criminalization of Native women: nonreservation Natives are jeopardized by their status as Landless Indians. Chapter 4 demonstrates how extralegal factors contribute to the criminalizing of various behaviors and the subsequent incarceration of women. Because of systematic oppression, women are vulnerable to various types of violence, and their individual experiences disclose the violence that permeates many social institutions. For instance, most imprisoned women were trapped by chaotic lives of poverty and abusive husbands. This chapter examines the types of abuse imprisoned women endured prior to incarceration, their respective reactions to the violence, and how their responses affected their eventual criminalization and prisonization. Racial/ethnic differences and gender dynamics are illuminated by exploring the relationship between individual lives and the structure of society, which is characterized by racist and patriarchal relations. Chapters 5, 6, and 7 analyze imprisoned women's experiences, which vary according to the race/ethnicity, location of confinement, and sexual preference of the women. While prison officials often speak about the concept "rehabilitation," the primary function of the prison is strict control of prisoners' behavior. Although all prisoners are critical of the prison's rehabilitation attempts, Native prisoners additionally perceive these efforts as culture-bound and racist. Prison policy is gendered and racialized. As such, it is based on distorted stereotypes that affect experiences in prison. Moreover, the violence experienced by women prior to incarceration continues inside the prison in a variety of forms including sexual intimidation, the overuse of mind-altering drugs, lengthy stays in lockup, and the denial of culture for Native Americans. In practice, prisoners' experiences with rehabilitation are less salient than their experiences with control. Depictions of relationships among prisoners and between prisoners and staff, as well as of prisoners' responses to punishment and control, offer additional understanding into prisonization experiences. Chapters 8, 9, and 10 investigate the concerns of imprisoned mothers, the prison's parenting program, and institutional support offered to maintain family stability. Whereas race /ethnicity is a significant factor in the overall experience of prisonization, reservation status again emerges as prominent in an analysis of mothering behind bars. For example, reservation status has an important influence on the major concerns of imprisoned mothers and on institutional support available for mothers. Furthermore, prisoner status has an effect on mothers' experiences: although women confined in the general-population building define separation from children as their major concern, women in maximum security are more immediately concerned with personal survival. Other concerns of imprisoned mothers are children's placement, behavioral adaptation, post-release problems, and contact with children. Prison support for incarcerated mothers varies by race/ethnicity, reservation status, and confinement location. While all mothers note that the prison's assistance in the maintenance of familial stability is insufficient, nonreservation Native mothers in particular determine that their needs are ignored. Additionally, Native mothers perceive the prison's rehabilitative parenting program as culture-bound. Chapter 11 offers a glimpse into the life of a Native woman who was incarcerated at the WCC and her readjustment to life on the outside. Gloria Wells Norlin, Little Shell Chippewa (Anishinabé), was imprisoned for fifteen months for a crime she did not commit. The Montana Supreme Court agreed that she had been wrongly convicted, but only after she served hard prison time. Her righteous anger over her imprisonment is directed toward the legal system, and presently she seeks legal recourse. A well-known and accomplished artist, Gloria is now, after much struggle, reunited with her family. She owns and manages an art gallery appropriately named "Indian Uprising." Gloria's story provides an understanding of the interrelated systems of oppression that operate to confine and control Native women.